In the last installment of Sean Hannity's interview with Rush Limbaugh, the talk radio host explains his view of conservatism and reacts to Obama's trip to the Middle East. Limbaugh says the foundation of conservatism is freedom. Rush says you can't recognize Republicans or conservatives in Congress today because they "seek approval" from political enemies. 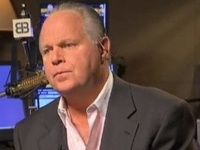 Rush also takes Obama to task for saying the United States is one of the largest Muslim countries. Limbaugh says the media thinks he can't make a "mistake" or do anything wrong.